Looking for hotels in Ao Thian Og? Surrounded by peace and nature in Koh Tao, The Fisherman's Villas offers cozy self-catering villas with stunning ocean views. This stay was so lovely. First off, Carole (our host) was amazing. She helped with ever thing we needed. We stayed in a villa with a private pool which had an amazing view! The rooms are clean and well designed. This place is instagram goals! The staff is very friendly. We were able to order delivery food (breakfast/dinner) to our villa both nights we stayed. The beach is about 15 -20 minutes to both beaches walking but it's suggested you take transport there because the hills are steep. But there's also a diving dock, where you can take in the views or snorkel. Definitely would stay here again! Villa Sabai Jai - Eagle, Gecco and Turtle Villa offers free round-trip transfer from Mae Haad Pier, a 10-minute drive away. The villas are a self-catering but with a daily cleaning service included. The pictures of the villa on Booking.com are spectacular, yet the reality is even BETTER!! This place is absolutely amazing!! We were here when the storm hit and the staff (Nicki and WaWa) could not have been more accommodating when we had to stay longer. We felt very safe the entire time. We highly recommend a stay at the villa for a romantic celebration or for family reunions. Featuring a spa center, Haadtien Beach Club is located in Ko Tao Island. Everything was perfect, staff was extremely friendly. I definitely come back again!! Located in Ko Tao, Cape Shark Villas offers luxurious villas and a private beach area. It features comfortable villas with free WiFi in public areas. Private pool are also available in selected... Amazing views, awesome deck with private infinity pool, spacious rooms with comfortable beds which is hard to find in Thailand, delicious breakfast and lots of food options to order for delivery. Kind staff. Felt like we were staying in paradise. 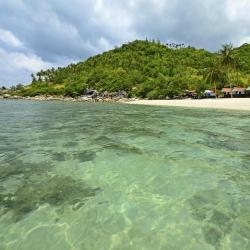 Haadtien Beach Resort is a boutique resort nestled on a secluded beach in Koh Tao Island. I like private bungalow and beach view window. Jamahkiri Resort & Spa provides luxurious accommodations along Thian Og Bay on Koh Tao Island. It offers WiFi and pier transfers for free. This is a beautiful resort well worth the money. The staff are awesome! Featuring a terrace and free WiFi, Rocky resort is located in Ko Tao, 1.6 miles from Mae Haad Pier and 3.3 miles from Sunken Ship. Offering sea views, Coral View Villa is a property located in Ko Tao, 2.1 miles from Mae Haad Pier and 3.7 miles from Sunken Ship. Guests staying at this villa can use the free WiFi and terrace.